I've had this thing for at least a year now, and never quite made it around to working on it. It arrived with a little rust, and a cut off power cord. Even when I did start working on it I couldn't find any information at all beyond an original advertisement and people's fond memories. I'll post up more photos over the weekend, but mentioning it now because I had a bit of a win tonight. - replaced NEC 780 (Z80) CPU and CPU socket - symptoms now consistent - with everything fitted, ON light was flashing on keyboard, no more weird beeps. - contacted Herb who sells/scans S100 manuals, and had a Visual 200 user manual, turned out a successful POST results in the CAPS LOCK light turning off - which it was. He also mentioned that the system should display a white cursor and nothing else on startup. - quickly reassembled while my wife was watching, gave her fair warning it might go bang but ended up saying "oh wow, I've got a steady ON light, what's on the screen?" "a white box" she said! I still need to test the EIA (RS232 in cool kid talk) interface works, and need to put all new foam pads in the keyboard, but I'm extatic with the fact that this 1981 workhorse is alive again. I'm also amazed the 34 year old video board, which relies heavily on electrolytic capacitors and large current flows, works without any adjustments. First thing I looked at today was the keyboard, I'd been warned previously it was a Keytronic but I was surprised to find inside that only one key had actually gone bad - most of the foam pads were still foamy and doing the job. To eliminate it being a possible trouble maker, I've left them seperated, cleaned the circuit board, and am just using my fingers (which works fine with these). I can't get any characters to appear on the screen while typing unfortunately, but I can activate system functions such as On/Local, Reset, Caps Lock etc so I know the presses are working on the system is getting the message. The keyboard is fairly simple, two basic ICs, under the covers an extra LED and IC socket are hidden - I believe these were for the "Block Mode" upgrade. But wasn't having much luck. 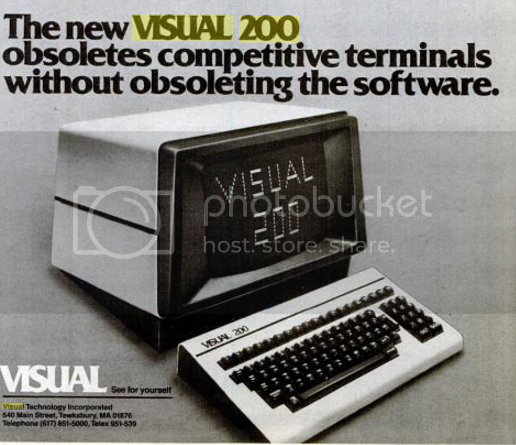 Configured as DTE, the Visual 200 wasn't interested, and configured as DCE the Visual 200 would repeat back the exact same characters (slightly offset by about two characters at 300 baud). So something is wrong on that side of things - finding the fault could be time consuming as there is no circuit diagram available. I now have the original reference manual, but beyond CRT adjustments and how to program the terminal, it's best advice is "Replace logic board". So now I'm tracing signals with the scope, and trying to work out how the interface should operate - since it seems to fail on send and receive I'm trying to find a part that's responsible for both. There is no UART in this design, it's all 74 series logic, a couple of 75 series bus transievers, and an 8116T baud generator (which originally I thought was 8116 DRAM - and got confused when my new 8116 chip was too small for the socket ). So it powers up, passes it's self test, and displays a cursor, but I can't quite get any text on the screen. If I can't find anything specific, I'm just going to order one of each logic IC and replace one by one. I have a soft spot for these terminals having sat in front of one for hours and hours for data analysis when I was a grad student! Did some thinking and investigating, and I think I've got a bad TTL chip that results in traffic being directed in correctly. Incoming serial should go to the 8251, then back in to the video buffer, but I think the "lane" isn't being switched, so instead of sending it to the video buffer it ends up being resent as serial. Just theorizing. I did follow the RS232 signal through a transeiver and through a few TTL chips (looking up the datasheet for each as I go along) but eventually got lost - I'm just going to replace the chips (and test on removal) in the area between the 8251, 8116T baud generator, and port itself - then we'll see. I did replace an overheating 74LS32N in that area earlier on, and to follow a trace I did remove a 74S08N right next to it - which I have tested as failed - but I may have damaged it on removal so it may or may not be related. Thanks for that link. I might get one of those IC testers. It's better to use that than my Apple II+ clone for such things. Does it do 4114 and 4164 DRAM as well? There is a 74 TTL series DRAM chip, but other than that, no memory options unfortunately. I haven't cycled through the 4000 options yet, but I suspect it only covers the basics, but for the price it's a neat tool to have lying around. Whoa - and cheap direct from China.